Stenting can convert a stable plaque into a vulnerable plaque . . . True or False ? 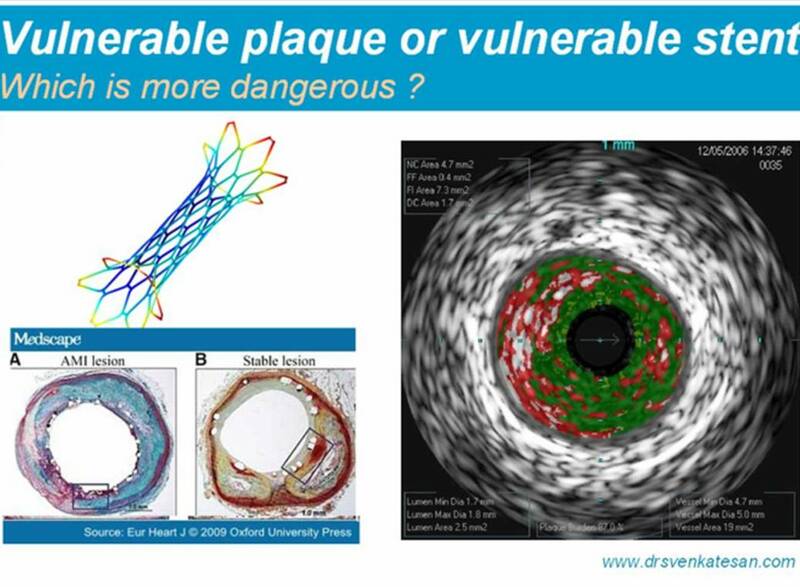 An atherosclerotic plaque is termed vulnerable when it’s future behavior is unpredictable .A vulnerable plaque has a tendency to get occluded at any time. Note the T cells and macrophages wage a losing battle against a metal monster ! What is the best method to calm down these vulnerable , hot ,inflamed plaques ? A stent which scaffolds a plaque is believed to stabilse it and make it less vulnerable to rupture. This is the most optimistic view on coronary stenting . Here comes a pessimistic view ! A metal inside a coronary artery covering is additional threat .A metal is perennially thrombogenic ,especially the drug eluting stents which suppress the normal endothelial function . What is the realistic view ? When stenting is done indiscriminately( without application of mind ) in stable non flow limiting lesions stability is replaced with vulnerability. Is it not curious to know any angina in a patient who had PCI for chronic stable angina is labeled as unstable angina. Following are typical clinical scenarios where stents could carry a vulnerability tag . And now . . . you answer my question ! Can stenting convert a stable plaque into vulnerable plaque ? If “yes’ is your answer your patients are in safe hands . If ” No” is your answer , you are fit to become a leading interventional cardiologist ! All that do not glitter . . . Bare metal stents pip Gold coated stents convincingly! Ever since coronary stents were introduced metal market is having a good time within human coronary arteries.The search for the the elusive , ideal metal is still on . . . Nickel , stainless steel , platinum etc . Some body thought , why not gold ? For long , gold is known to be a good bio -compatible metal . Two Gold stents were tried . Surprisingly , both showed increased reactivity with coronary endothlium . The verdict was clear . 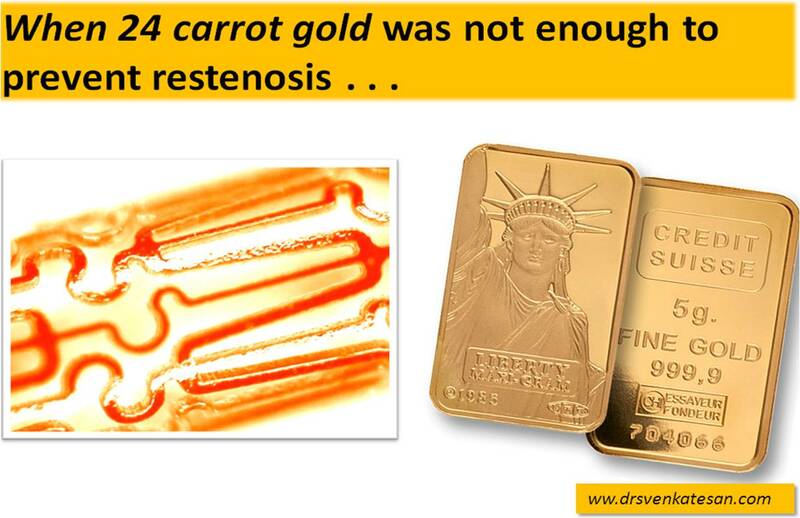 Gold coated stent was not good enough. With the advent of DES , gold coating of stents lost it’s popularity .Unless new innovations happen in gold metallurgy , the future looks bleak for this precious metal , at-least in the human coronary arteries. What are the precautions to be taken during PCI when we encounter thrombus containing lesions ? Avoid the procedure if not really indicated.A lesion which has more thrombus load than a plaque and it is , subcritical and not limiting the flow , PCI may be inappropriate especially if the ACS is stabilised. Predilatation should be minimally used or to avoided.Direct stenting preferred. Distal protective devices are “hyped up devices” rarely useful in an occasional patient with good distal vessel diameter. Pseudo stent approximati(fig 1) may occur. A Layer of thrombus may get plastered between stent and the vessel wall.In the post PCI phase , with intense anticoagulation and antiplatelet regimen this layer may get dissolved and stent may lose it’s grip and may dislodge or migrate.Another possibility is the dead space beneath the stent becomes a potential site for future thrombus and ACS. 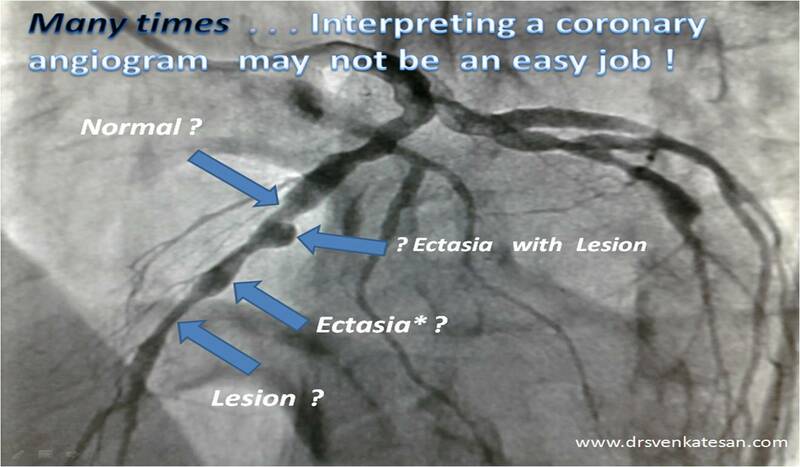 What are the most common indications for coronary arery by pass surgery? Coronary artery by pass graft surgery has become the most common cardiac surgery done world over ever since it was first introduced by Favalaro in 1969.The common indications are, triple vessel disease and left main disease in any of the following situationsE. Combining CABG and PCI in the same patient is followed in very few centres . (Example LAD graft and RCA angioplasty)This is done in patients who have co morbid conditions who can not tolerate prolonged surgical times.Further there can be situations one lesion is very ideal for PCI while for other grafting is the only solution. 2.Incidentally detected CAD* following routine coronary angiogram. Coronary artery surgery study (CASS) still has considerable influence among the cardiology community in the decision making process for CABG , even though it is many decades old .There has been a phenomenal development in both medical as well as interventional techniques since CASS . (Thrombolysis, Statins, ACEI, PCI DES to name a few) . When CASS study was done many decades ago,it was believed triple vessel disese constitute a homogeneous population and carry the same clinical significance . For example a 90% proximal LAD , 50% RCA and 50% OM technically qualify for a CABG and unfortunately , some of them are subjected to it even in 2008 ! Now we clearly know, it is not the number of diseased vessels that is important, but it’s location, severity , LV function, presence or absence of diabetes . Finally , the presence of revascularisation eligible myocardium must be documented in all post MI patients . (Technically referred to viable & ischemic myocardium ). Currently , with the PCI & medical management has grown so much, CABG should be reserved only for, critical triple vessel disese , with at least one proximally located lesion (Mostly LAD or Left main ), especially in diabetic individuals.